Endocrine-disrupting chemicals (EDCs) affect the neuroendocrine system which in turn influences the reproductive regulation. Neuronal genes disrupted by EDCs are the gonadotropin-releasing hormone (gnrh2), the Kiss/GPR54 system that regulates gonadotropin release and cyp19b gene encoding brain aromatase. In the present study, pubertal Catla catla expected to spawn for first the time in the coming season were exposed to graded concentration of bisphenol-A (10, 100, 1000 μg/l) for 14 days. Messenger RNA (mRNA) levels of neuroendocrine genes, i.e., kisspeptins and their receptors, gonadotropin-releasing hormone type II and brain aromatase were studied after 14 days exposure. Results showed that bisphenol-A (BPA) strongly upregulated expression of kiss1, kiss2, gpr54a, and gnrh2 in fish exposed to 10 μg/l BPA. Fish exposed to 1000 μg/l BPA, expression of kiss1 and gnrh2 were comparable to control while kiss2 mRNA increased compared to controls. 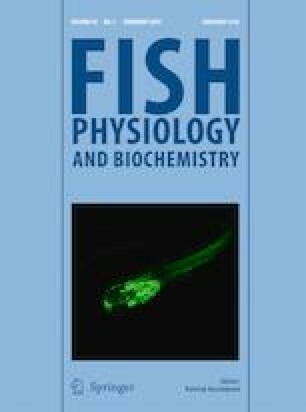 Brain aromatase (cyp19b) mRNA expression increased in fish exposed to both 10 and 1000 μg/l BPA. These results indicate that BPA exposure can disrupt organization of the kisspeptin signaling pathways. This neuroendocrine disruption may be the underlying mechanism by which a suite of reproductive abnormalities are induced.